In Part One, Leon Engelbrecht examined the background to South Africa's multi-billion rand Defence acquisition programme. He also looked at the programme's cost and the expected benefits, or offsets, for the broader economy. In this second and final part he explores whether these justifications hold water and after making a few predictions regarding the future course of this and other programmes, reaches his own conclusions. The views he expresses are his alone, and do not necessarily reflect those of the South African Government or its Armed Forces. The South African government has never sought to justify the programme on the merits of the equipment to be purchased or the existence of some military threat to the country. The Defence White Paper and the Defence Review proposed a balanced, threat-independent force structure and equipment selection precisely because no clear or present threat existed at the time or materialised since. Instead they rationalised the purchases with reference to the anticipated offset R29-billion spent on arms would generate investment and trade worth at least R104-billion and save or create 65,000 jobs. The deal would therefore more than pay for itself. This approach has been decried by many mainstream and fringe economists, some calling the argument "voodoo economics." The critics point out that the promised offsets in other deals have seldom fully materialised. They say that if government's logic held true, why was it and other governments not spending their entire budget on defence to raise revenue? While it is arguable whether the full value of the offsets will be realised (and will be measurable) it is also beyond doubt that many of the prime contractors are committed to discharging their obligations. In September 2001 BAE-Systems said it had already discharged 77% of its NIP and DIP offset obligations (or was in the process of finalising the related arrangements) despite not yet having delivered a single Hawk or Gripen. DIP offsets, in particular, are rolling in and have certainly saved many domestic defence concerns from certain bankruptcy. Companies such as Denel and Grintek are being awarded order after order. Among the latest are that Denel and Grintek will benefit from Hungary's possible order of Gripen fighters for its air force and that Denel will help manufacture components for the Avro RJ's ordered by Bahrain. Denel Aviation is already also manufacturing gearbox components for both Rolls Royce and General Electric turbine engines as offsets for their selection to power the Hawks and Gripens respectively. On the down-side, companies such as Thyssen were by August 2001 warning that the poor public perception about the programmes and the allegations surrounding it was making it difficult for that company to attract joint-venture partners for NIP projects. These, as seen above, are expected to realise 35% or R24-billion of the offset total. The implications are troubling and it is hoped that the situation will improve once the allegations regarding the prime contractors are shown to be baseless. The Defence White Paper and the Defence Review mandated that the country maintain small though well-armed and high-technology armed forces. Stock was taken of the SANDF's inventory and it was found that the SAN in particular was in dire straits after years of under-investment. Its submarines were ordered in 1967 and delivered from 1970. The FAC(M) were ordered in the mid-1970's and delivered from 1977 onwards, initially from Israel. Both had come to the end of their useful lives and a decision had to be made to either replace them or disband the navy. The latter was never seriously considered. The Alouette III helicopter fleet had become equally antique the first had been delivered to the flying service in 1962. The SAAF's Impala and "souped-up" Cheetah fighters were also becoming elderly and expensive to maintain. The helicopters, the service's maids-of-all-work, were important to the country in that they provided a necessary search-and-rescue as well as police support capacity and were therefore a routine sight over the country's cities, beaches and mountains. In the case of the fighter fleet a similar option to that of the navy existed replace or disestablish the SAAF's fighter capability. Again, despite the presence of the anti-military lobby, this latter option was never considered. The Defence Review, as adopted, therefore made it clear the SAN would have to receive new ships and submarines and the SAAF new LUHs and fighters. The SA Army's needs were seen as less pressing as it had been largely re-equipped in the 1980's and early 1990's. It is now three years since the Defence Review was adopted and it is unclear when another will be embarked upon. The force design it proposed (and which has been continuously tinkered with since) was based on fulfilling a constitutional requirement "to defend and protect the Republic, its territorial integrity and its people..." The Defence White Paper gave the SANDF secondary as well as collateral tasks. The former related to assisting the civil powers in law enforcement , or disaster relief as well as extra-territorial peace support operations. The latter placed SANDF assets at the disposal of other government departments. But South Africa's location and the absence of any present military threat has meant that the SANDF's secondary functions, and in particular support to the SA Police Service under the country's National Crime Prevention Strategy, has become its de facto primary functions. The MoD may, however, only budget for the SANDF's primary function. Not only must the rationality of this be seriously and urgently challenged, but the question should be asked whether the armed services are being equipped for the role they are playing. No matter what the economic rationale or offsets, purchasing equipment for a latent primary function and refusing to adequately fund or refund the SANDF for its secondary functions is downright foolish. While a military threat can potentially develop in a short time this generally does not happen too often or too rapidly. South Africa is also wed to a policy of seeking negotiated solutions to conflict. Force is only to be used as a last resort and then usually as part of an international or regional coalition. This raises the possibility of other countries in such alliances providing units and capabilities perhaps lacking in the SANDF. For this reason the acquisition of both the ALFAs and submarines must be seriously questioned. It is attractive and prestigious to field fourth-generation fighters and modern attack submarines but are they justified in the numbers sought or at all? The Gripens will undoubtedly give the SAAF sub-Saharan air superiority if not outright air supremacy but to what purpose why does it need to overawe its own allies? South Africa has open ocean wastes to its east, west and south. To the north are friendly neighbours, nearly all of whom are economically dependent on South Africa. They have no economic or political reason to antagonise their southern neighbour or to threaten its sea or airspace. The justification for purchasing these aircraft are flimsy. The same can be said of the submarines. Only three African countries, none sub-Saharan, have submarines Algeria, Egypt and Libya. Hardly any sub-Saharan state has an operational (let alone deployable) navy and none are known to harbour any ill will towards South Africa. This is also true of those countries along South America's Atlantic seaboard, of non-African states along the Indian Ocean rim and of ocean-going navies further afield the latter representatives of the region's major trading and investment partners. Submarines are certainly a strategic deterrent and a useful way to gather intelligence and deliver special forces. The capacity, once lost, will take many years to regain. Still, who exactly are the South Africans attempting to deter, eavesdrop upon or subject to special forces attention? No ready answer comes to mind and it therefore seems that the acquisition of the submarines is a costly extravagance. Should this view be mistaken, the SAN's corvettes, missile-armed maritime helicopters and FAC(M), perhaps along with allied submarines, should defeat the danger. Examining the merits of the main equipment chosen is a tricky proposition as the criteria used by the government remains somewhat unclear. Since the departments of trade and industry as well as finance were equals with the DoD in the selection process, and since price and offsets were as important as the characteristics of the equipment itself, it follows that the cheapest bid or the best suited system was not necessarily the first choice. Using available information and a literature study, how good (subjectively judged) were the selections? 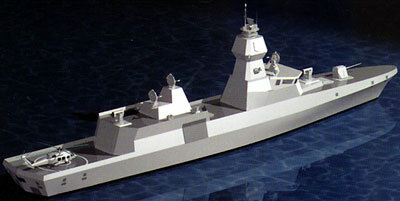 South Africa has ordered four Meko A200SAN corvettes. This is a new, stealthy, variant of the established modular Meko 200 frigate series. While several of the other offers, especially the French La Fayette and the UK Marconi F3000 design were suitable, the modular design and stealth characteristics of the Meko were probably superior. Of concern, however, is the selection of an untested indigenous point air/anti-missile defence missile system for the class, over -- for example -- the well proven US-German RAM anti-missile system. The light calibre of the ship's gun (76mm) can also be criticised as it will be limited in the shore bombardment role. The Meko's will carry the French Exocet, a superb anti-ship missile, but with no known land-attack ability. The modular design of the ships will at least allow modification at short notice and the appropriate plug-in gun and missile modules should be available from Germany if required. The SAN has also rightly pointed out that four of these ships are the absolute minimum required. Additional funding will have to be found to expand the class to a realistic minimum of six. In the meantime, the navy should overcome its reluctance to crew the offshore patrol vessels (OPVs) currently being sought for the country's environmental affairs department ships that will broadly fulfill the same peacetime functions in the same waters as the corvettes. Their wariness discredits the seagoing service. A final worry in connection with the corvettes is the lack of finality on the purchase of their maritime helicopters. The ships cannot hope to be effective without their rotorcraft and a signed contract to purchase at least four is overdue. It would also be sensible for a return to the original requirement for six. The selection of the submarines have already been criticised. But since they are on order, how does the selection own up? Again three submarines are the absolute minimum a navy can operate if it is to have a credible sub-surface force. This can be seen with the Daphnes of which only two are still in limited operational service a fact that undermines their residual deterrent value. As far as the selection goes, the Daphne is an antique design and it can be questioned whether further upgrading the boats or taking free transfers from France or Spain would have any value. Of the designs on offer the Type 209 is probably the more mature (after the Daphnes!) but as new builds come with the latest technology. The Collins-class [pictured left] fiasco in Australia has done Sweden no good. The Scorpene is, on paper, a good design, but as the first-of-class are only now being built it remains to be seen if the design is as good in reality. The Collins boats have shown glowing reports but cannot always be believed. What is regrettable is that the SAN has not taken the opportunity to install a air-independent propulsion system in the vessels. Several designs, albeit all still slightly immature, are available. Fitting the system now will be a great deal easier now than later. 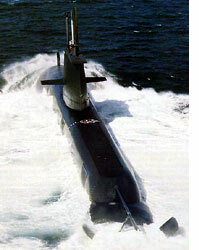 It is hoped the SAN will in due time consider equipping the submarines with a missile capacity. Several torpedo tube-launchable systems are available and will likely be sold on request. A land-attack capability will also be a most useful addition. Turning now to the Gripen ALFAs, a reading of the available literature also places this nimble fourth-generation fighter at the top of the list. Particularly impressive is its range of capabilities, its ability to use unimproved roads as runways (a plus in southern Africa) and its ease of maintenance. The latter is a definite advantage in South Africa where a general skills shortage means that the SAAF cannot readily afford highly skilled groundcrew. None of the other offers come close on these points. What is perplexing is the numbers nine two-seaters and 19 single-seaters. According to current SAAF chief, Lt Gen Roelf Beukes, all except one developmental two-seater will be allocated to a single squadron. Why eight trainer variants for one squadron or are some to be strike package leaders or similar? The figure of 19 single-seaters also does not readily compute. The same can perhaps be said of the number of Hawk LIFTs purchased. The SAAF seem to have a tradition of over-investing in trainers. In what is now widely considered a flawed deal (with corrupt undertones) the SAAF in the last years of the white National Party government purchased 60 of the Astra trainer aircraft. Fifty-three of these remain and about 23 are now in storage as they are surplus to requirement. Fact is they were surplus to any possible requirement even before they were ordered. Is a total of 24 Hawk LIFTs a sound decision? Considering the need for attrition or combat depth and the likelihood that they will be divided between a flying school and an operational squadron (albeit co-located) the answer is probably yes. The selection of the Hawk has been criticised with some arguing it is too complicated and that the country has been over-charged. Since its cockpit outlay is deliberately similar to the Gripen, the first charge misses the point while the second is flawed even if true in light of the offsets that has since accrued to the state-owned Denel group. The fact that it posted its first surplus in about four years during its latest completed financial year speaks volumes for government's decision. It is unlikely that any of the other, perhaps cheaper, options would have led to similar results. As regards the choice of the Agusta A109M [pictured left], the literature study shows the Eurocopter might have been a better option. It is likely though that price, offsets and perhaps a desire not to place all the orders in northwest Europe might have led to the choice. There has been some criticism of the suitability of the A109M for South Africa's hot and high conditions. The SAAF has experienced disappointment in this regard before. From 1967 to about 1990 it operated the French Super Frelon in a high-lift role. The helicopter could only do this at the coast and was not efficient at altitude. 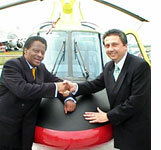 One trusts the SAAF remembered the lesson when ordering the A109M. The 40 LUH will be replacing 30 Alouette III's the additional 10 certainly being welcome. Perhaps more can be afforded in time. While some may facetiously say that a number of "pros" have pulled a couple of "cons" on the South African government, this is not the case. It is true, however that far too many local smooth operators were in on the act and out to make a quick buck for themselves. All kinds of "consultants" offered bidders to most ridiculous assurances that they would win their respective bids at ludicrous rates. The sour grapes many bidders felt at DEXSA was no doubt made more vinegar by the realisation that they had been misled by their "advisors." A lesson to future bidders to beware of local "experts" who offer a quick way into the procurement system. The correct way seems to first approach the operational end user and with the latter to approach the appropriate service director in the DoD's Departmental Acquisition and Procurement Division (DAPD), who will engage the DAPD chief, who will approach the Defence Secretary, the political level and Armscor, the DoD's acquisition agent. As far as the programme is concerned, the majority of "pros" or advantages are already listed above. In summary, the SAN and SAAF are to be recapitalised, the economy in general and the defence industry in general is benefiting from offsets and greater global integration and thousands of jobs are to be created or at least be spared. On the down-side is the cost of the programme (whatever it may eventually be) and its impact on the economy regardless of the total value of the benefits South Africa ultimately derive from it. Many lessons can be learned from the programme and the circumstances that surround it. The first, perhaps, is "seller beware" of whom you are dealing with. Others relate to government's handling of the programme. DAPD Director of Weapons Systems, RAdm (JG) Keg Verster in June told the tri-agency public hearing the DAPD lacked the capacity to handle multi-project programmes of this sort and he advised that the exercise not be repeated. This is in itself a lesson learnt. With it goes that the DAPD must be strengthened so that it can handle at least two major acquisitions, as well as multiple minor ones, at any given time. Many of the allegations of impropriety made in connection with the programme related to conflicts of interest and ethics violations. Steps must be taken to avoid these pitfalls so that disgruntled parties will not again have the opportunity to discredit an otherwise above-board programme because of the failings of a few individuals inside or outside the procurement system. Much credibility was needlessly lost here. The South African cause was not helped by the arrogance of some senior officials. The CEO of at least one European firm has recounted how he arrived on time for an appointment only to be kept waiting for an hour. He was not amused. Reports indicate this type of treatment is routine with this official. When dealing with industry leaders officials should heed the conventions of international business best practice. Even more goodwill was wasted by the government's persistently poor handling of the media. This allowed suspicions, grievances and innuendo to grow into allegations, which were left unchecked to firm in number and credibility. Government background briefing documents and heated replies from ministers have often came too late to have effect. Some of their attacks on the programme's critics and even the Parliamentary Standing Committee on Public Accounts which they called ill-informed hightened rather than lessened public mis- and distrust already fanned by evasive answers and contradictory evidence presented at the hearing. Many otherwise implacable government supporters have hammered the programme for its putative social costs, saying every rand spent on defence was one less for housing, health-care and other critical socio-economic programmes. Government's patient explanation has yet to penetrate the previous ideological programming of these disparate groups who also share an aversion to globalisation and see the state's macro-economic strategy as "neo-liberal" and unacceptable. One of the latest developments in this area is that one of the ruling African National Congress's own MPs is demanding a hearing on whether recent increases in the defence budget to pay for the programme was taking money away from programmes to aid women and children. After the ANC formed the country's first post-apartheid government in 1994 there was much talk of slashing defence spending and realising a "peace dividend" that could be used to fund social programmes. Problem is, as one admiral put it, they then spent this dividend before they produced it. If South Africa is now purchasing submarines and fighters it perhaps does not need, are there other requirements going unmet? To objectively determine this will likely require another defence review, especially since the strategic sands have shifted since that document was adopted by Parliament. This is perhaps another lesson, the institution of regular defence reviews to ensure that procurement matched real requirement. There is growing evidence of a crisis in the SANDF in the availability and quality of combat (camouflage) uniforms and personal equipment. Why this is so is unclear as the country in the past manufactured uniforms and boots of exceptional quality. Uniform provision to both the regulars and the reserves (where the bulk of the problem seems to lie) was, while not perfect, at least adequate. Now some territorial reserve units are reporting that they are purchasing items at SANDF disposal sales to cloth their troops. Turning to main equipment, there is a pressing need for new utility trucks to replace the 2, 5 and 10 ton SAMIL (SA Military) series currently in use. Adopted in the early 1980's they have now reached the end of their useful lives. Looking at the African littoral, the Congo-basin (where the country has peacekeepers deployed) as well as the adjacent Great Lakes region, where large bodies of water exist, the SAN and the SA Army's engineer corps are in urgent need of amphibious equipment and riverine craft. The SAN currently has no riverine craft or experience and only nine small utility landing craft. The SA Engineer Corps possess a few pontoons and workboats. The distances involved dictate an investment in sealift as well as airlift. The SA Navy's two combat support ships, meant for underway replenishment, are insufficient, as is the SAAF's fleet of 12 C130BZ's and Casa aircraft. In this context a single assault ship of the British HMS Ocean variety or a landing ship similar to the US LPD17 San Antonio class would be of far greater value than three submarines. As a result of experience in East Timor Australia, a country in a similar geo-strategic position to South Africa, is enhancing its amphibious ability for this very reason. The Army and the SAAF are also in need of ground based air defence systems and a funded programme currently exists to acquire a battery of man-portable very short range air defence missiles. An requirement exists for a short range system for the Army's air defence artillery as well as for SAAF point defence. The need can be met by an indigenous system and it is hoped that in time this will be acquired. The Army also has plans to acquire a new fleet of infantry fighting vehicles and armoured personnel carriers (to be domestically produced) in about a decade and new main battle tanks five years after that. By then the current multi-billion rand programme will have been completed and the equipment paid for allowing for these new acquisitions. Other programmes that should enjoy attention include more unmanned aerial vehicles for reconnaissance and attack duties for the SAAF, maritime patrol aircraft to act as force multipliers for the corvettes and OPVs as well as both airborne warning & control (AWAC) as well as search, track and attack radars (STAR) together with precision attack munitions. One can only hope that South African troops committed to littoral operations or peace support over the next decade will not be stranded on some desolate shore with worn out vehicles and without adequate logistic support or arms. The country is committed to the programme as it stands. The contracts underlying the programme are apparently cast in concrete and the penalties as well as loss of face should they be cancelled unacceptable to the government. President Thabo Mbeki in a heated television address to the nation in January 2001 made it clear the programme would under no circumstances be tampered with or curtailed. In the final analysis the South African government has driven a hard bargain with defence manufacturers to obtain weapons at a reasonable price and with the possibility of realising exceptional offsets. Whether these will materialise remains unclear but there is a sure commitment on the part of most of the contractors to perform. While the process that led the awarding of the contracts can be criticised, mainly because of a lack of capacity in the DoD as well as ethical failures, it was essentially sound. Allegations to the contrary are largely misplaced or sour grapes. The government also chose well. Price and offsets were often deciding criteria, but even so a reading of available literature shows that some of the best system was chosen in each category. But not everyone agrees with the numbers bought or with the categories selected for recapitalisation in all instances. There is good grounds to say other needs should have been prioritised over the acquisition of the ALFA and the submarines. The need for amphibious shipping and equipment as well as additional sea- and airlift, in addition to trucks should be stressed in this regard. Funding for more corvettes and maritime helicopters should also be secured. It is recommended that a defence review be held at the earliest opportunity to re-evaluate the SANDF's structure, functions and main equipment acquisition programmes. Should its views be broadly in agreement with the conclusions above it is further recommended that the second tranche for the ALFAs not be exercised as to free up money within the budget for more pressing needs. Other ways and means of freeing up resources should also be explored, including disposing of unnecessary assets.